1 – Everyone gets to be in the photos! It’s so important for kids to not just have photos of themselves as they grow up, but also images together with you, the parents. Memories of all the fun you had together as a family, and how much you love them. This will be one photo session you won’t have to beg and plead your spouse and kids to participate in. Everyone’s already relaxed and in vacation mode, it will be easy to convice them that a photo session is going to be casual and fun. 3 – You get to relax! You won’t have to worry about bringing your expensive camera to the beach, and potentially having it ruined by sand, water, and salt. Knowing that you will be going home with professional photos, you can relax and enjoy yourself, instead of feeling the need to capture every second of the kids having a blast. 4 – Leave technicalities to the experts! Lighting in different locations can be tricky, especially at the beach – hello nuclear orange skin tones and dark faces at sunset… and that was supposed to be the photo for the Christmas card. Your local photographers are used to photographing in their environment and have the knowledge and equipment to deal with these challenges. 5 – No post-vacation digital overwhelm! Returning to real life after a vacation is hard enough without having to sort through hundreds of photos to find the best ones. Wouldn’t it be nice to receive a package in the mail with a book, album or prints, and indulge in reminiscence? 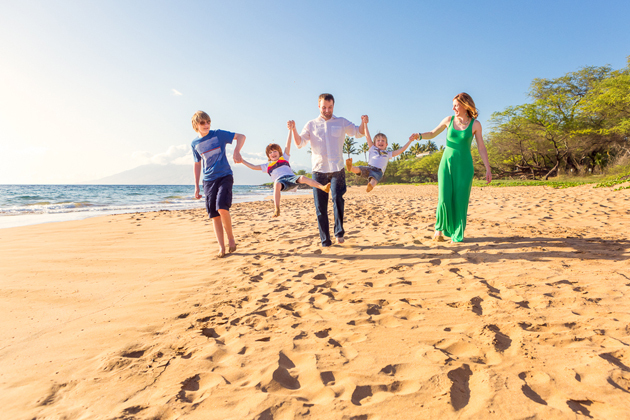 Be sure to visit our member directory to find a photographer for your next family vacation!